In your professional career, how often are you truly proud of the work that you are doing? For many of us, who are not heart surgeons, teachers, fire people, garbagemen, or other people that choose the jobs we don't, we are seldom afforded the opportunity to truly say, "we did good." Good is exactly what the Victoria Foundation does, by assisting those of us, who are most in need and who most want to help. Education. Employment. Neighborhood development and stabilization. Family unity and crisis prevention. Civic engagement. In its nearly 90 year history, there is no facet of our city that the foundation has not been an integral and committed partner and advocate. So when I was tasked with assisting the foundation with its search for a permanent home, it quickly became a mission of city pride. Economic development is often more social than fiscal. I used to say, "I can't simply worry about building buildings. I have to worry about where they are built, how they are built, who builds them, who inhabits them, and who works with those tenants. That is true economic development." The Victoria Foundation, with its grant programs, seeks to aid in the city's development, starting with the move into their new home on Mulberry Street. For the project, the foundation did it the "right way," a path of sustainability and local contracting. Brantley Bros. was the moving company, helping the foundation with a seamless transition. Celebrating their 35th anniversary this year, their patriarch, who unfortunately passed away earlier this year, would be extremely proud of the professionalism and reliability of the South Ward based firm, which handles moving and storage solutions for customers of all types. The architect for the project was Frederick Cooke of C+C Architecture, a local visionary and urbanist, who helped the foundation dream up ideas of what the space could be. The result is an office as open as the sky and its panoramic views of the downtown and nearby Manhattan. Fast Construction, a local firm based in the North Ward, provided all of the construction for the new offices, following through a vision that no one could anticipate in the early stages. Maude Lemaire, a local artist, put the finishing touches on the project, with an absolutely beautiful mosaic piece that welcomes visitors and the new inhabitants each time they step foot off of the elevator. Capturing cherry blossoms in full bloom, the piece pays homage to the past and present of our city, while giving us hope for a fruitful future. Atlas Desk, a local family-owned and operated furniture company,is responsible for all of the beautiful furniture that will help the creative and working minds within Victoria and their guests. Originally located Downtown, the company was displaced by the Prudential Center and has its new home in University Heights on Central Avenue. 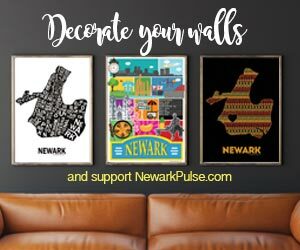 Yes there are things blooming in Newark, and often with a cherry on top.